Thank you so much to my friend Mau Cheng. I received a very nice birthday gift, one which is in my wish list for a while. A keyboard that has Back lit keys. Now, I got one. 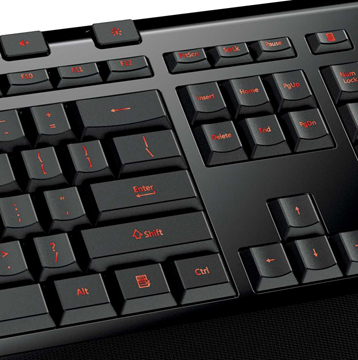 This is a Microsoft Sidewinder X4 keyboard. It has red colour lit keys, with three levels of brightness control, perfect for mid night scripting. It also has 6 times 3 programmable macro keys that can do almost any stupid work: such as typing “grasshopper” when you want to load it in Rhino. Despite I have to clarify that I use my own custom aliases in Rhino now. This keyboard has a much better key stroke feeling, which is much more comfortable than my antique one. Which is nice when I have to type a goo of paragraphs. Hopefully this will encourage me to type more in this blog or to participate more in other forums.